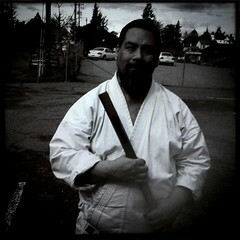 Today, the last Saturday of the month, we have weapons class at our Aikido school. last month and this month we worked on a set of katas representing “Sho Chiku Bai”, or pine tree, bamboo, and plum blossom. The katas come from a series of sword work John Stevens Sensei created. Although the series has many forms, we worked on the first six. They all use the shomen, yokomen, and tsuki strikes as responses to the attacks from uke. Sword work is an interesting thing. Although we don’t use live blades, we respect the sword as if they were live blades (and if you’ve ever been wacked in the head by a wooden bokken, it’s not any fun). This raises the stakes for both partners. As an Aikido practitioner, it gives us the opportunity to exhibit more precision and hence more care into our practice in the “spirit of loving protection”. When we come back onto the mats and do our empty hands techniques, hopefully we get a better sense of ma-ai and timing. There are many more aspects of sword work and why it is good to practice sword techniques, but this is one of them that I don’t really think about as much. It was nice today to practice outside with bokken and my son.